No doubt, a lot of dust has been raised by the suspension of Hon. Justice Samuel Walter Nkanu-Onnoghen by President Muhammadu Buhari led Federal Government, based on the order of the Code of Conduct Tribunal, CCT, a court of competent jurisdiction. The United States Embassy in Nigeria, the European Union and the United Kingdom have since weighed in, with statements of condemnation. The heat has gathered enough steam within the country, although quite a number of legal experts and pundits have expressed their opinion in support of the Federal Government’s action. The main opposition parties have since become the spokespersons of Justice Onnonghe, making flagrant statements in his defence, day in day out, while disregarding the substance of the contending issue. In the same vein, in 2016, the Prime Minister of Iceland Mr Sigmundur David Gunnlaugsson after the Panama Papers, those 11.5 million leaked documents that detail financial and attorney-client information for more than 214,488 offshore entities revealed that “he and his wealthy wife had set up a company in the British Virgin Islands.” The Panama Papers leak, which exposed how politicians and powerful figures across the world hide their vast ill-gotten wealth, attracted global outrage, that spanned up to our homeland – Nigeria. The President of the Senate of the Federal Republic of Nigeria, Alhaji Abubakar Bukola Saraki was also exposed by those leaks. At least four assets belonging to him that were not declared to the Code of Conduct Bureau as required by Nigerian laws were uncovered. But guess what! Since Nigeria is not a “saner clime”, Abubakar Bukola Saraki is still not only occupying the number three position, but used it and his vast questionable riches, to take advantage of our rotten judicial system, and got off the hook. He still is using his powerful position as number three citizen to subvert the rule of law and undermine our hard earned democracy in his desperate quest to drag us back to the dark days when some elite citizens were above the law. What is happening appear to be a seeming gang-up by the elites in the opposition against an enigma whose integrity is uncontested. The President has taken himself to the public court particularly the judiciary by challenging all those opposed to the suspension of the CJN; “I expect the opposition to get a copy of my Assets Declaration form and expose my insincerity. I have immunity, yes, but if I forgot to say the truth in that form, immunity will not stand on my way to resignation… we must start to value the sacredness of our country because we have no other country, or let me say, I have no other country…”, the president said. Nowhere else in the world would such impunity as demonstrated by the former CJN be celebrated except in Nigeria. Several examples of sanity abound in the deeply entrenched democracies of Europe and America, and even Africa and Asia. A close one here in Africa is that of the Liberian Information Minister Lawrence Bropleh, who was mentioned in a government audit report to have embezzled a paltry sum of $200,000 in 2010. Mr Bropleh resigned from his position as a cabinet Minister in President Ellen Johnson-Sirleaf’s government. In South Africa, as late as 2018, President Jacob Zuma resigned as president of South Africa after he was romped by corruption scandals. Mr Zuma was accused of “benefiting from $24 million in taxpayer money spent on ‘security upgrades’ made to his rural residence, including a swimming pool and cattle pen.” He had to resign, albeit after enormous pressure has been mounted on him. What is the position of the law? 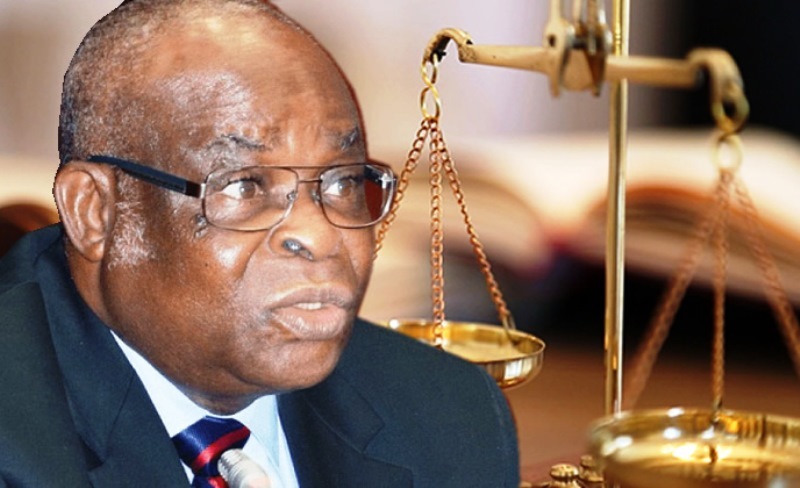 Can the President of Nigeria suspend the CJN as he did in the case Justice Samuel Walter Nkanu-Onnoghen to clear the way for proper investigation of the suspected breach? Given the subsisting issues, and rightly too, the CCT directed President Buhari to suspend the CJN. As a principled respecter of the rule of law, and indeed conscious of national interest, what the President did was to faithfully respect the court order. Yes, the President can suspend the CJN as prescribed by law. The President is reversing the trend and establishing a template of the fight against corruption. Obviously, corruption is fighting back and, very dirty too. Perhaps only Nigeria could afford to continue with a Chief Justice whose hands were soiled with corruption, to which he has already owned up. This brings us to the question of whether we are serious at all, as a nation, in our turtous journey to glory, or we are just been rhetoric on all issues of national development and rule of law. Before the advent of the Buhari administration, we only hear of prosecutions of top government officials for corruption and other criminal offences, in countries like China, USA and Europe. This is the first time in our country that the fight against corruption was taken to the highest quarters. No President has ever shown this level of commitment, sincerity and audacity to stem the tide of corruption in our country. Today in Nigeria, two former governors, all of whom were members of Buhari’s ruling APC are serving jail terms for corruption. The Secretary to the Government of the Federation, (SGF) was not only sacked from his position by President Muhammadu Buhari, but he also directed that the former SGF be prosecuted and, if found guilty, jailed. Mr Babachir David Lawal is one of Buhari’s favourites, if not the most favoured. This is clear evidence that this administration will not spare anyone found to be corrupt no matter how close he or she may be to the seat power. Judicial corruption was faced headlong by this administration in 2016 when the Department of State Security, DSS, acting on credible intelligence clamped down on corrupt judicial officers, breaking the “mythology of the sacrosanct authority of the judge in Nigerian affairs.” DSS made amazing discoveries during the raid on some judicial officers’ residences and offices. The opposition in Nigeria have proven themselves true to type; having sensed an imminent defeat come February 16, they are employing desperate measures to scuttle the 2019 general elections. Their target now is to overflog this issue with a view to whipping up sentiments locally, in order to attract the attention of the international community. Hon. Justice Samuel Walter Nkanu-Onnoghen should be bold enough to face the allegations raised against him in the Code of Conduct Tribunal if he truly is not in cahoot with the opposition, in sabotaging the war against corruption. Similarly, he should know more than any other person in the country, that he is not immuned from prosecution by any law of the land. If the international community is sincere about fighting the cankerworm of corruption especially in developing countries like Nigeria, the action of the Federal Government should be applauded. The strategic position of Nigeria in the comity of nations has made her to be one of the most important countries in world. The international community must not succumb to the antics of desperate politicians and agents of destabilisation who were the architects of wanton corruption and brigandage that stagnated our progress and development for so long. The world cannot afford a politically unstable Nigeria at any point in time, given its population, particularly its complex mix. The threat of destabilising Nigeria through any political faultline could lead to a crisis of monumental dimension. If a country of over 180 million people in the sub-Saharan Africa is let loose due to orchestrated constitutional crisis, the social fallout could threaten international security, the consequences of which could only be imagined. It is against this backdrop that, this writer is asking Western powers to rethink their approach to this issue.